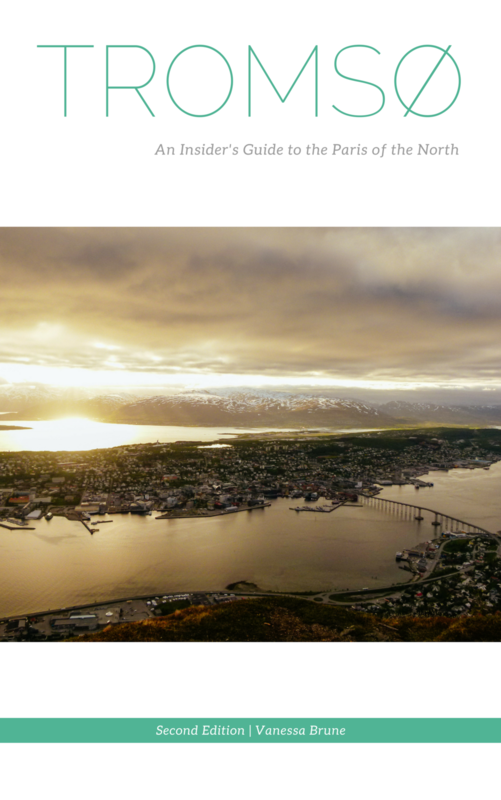 This post was created in collaboration with Magnetic North Travel and Basecamp Explorer. As always, all opinions remain our own. 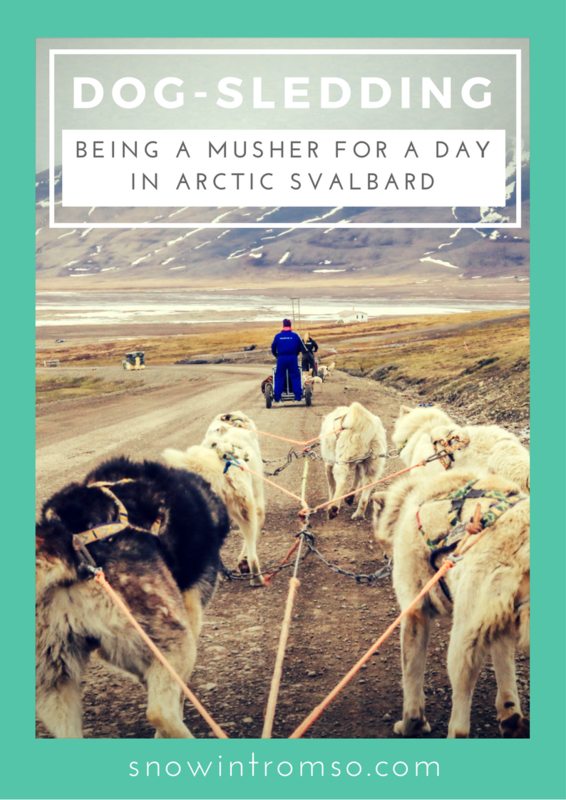 When Vanessa of Magnetic North Travel proposed to me to go dog-sledding during my visit to Svalbard in June, I was slightly shocked for a second. Dog-sledding in June? Is the climate in Svalbard really that cold that there’s still snow on the ground in summer? I soon learned that it isn’t in fact that cold this time of year and that there’s such a thing as summer dog-sledding – using a wagon with wheels instead of a sled. To me, the idea sounded absolutely brilliant. Dog-sledding without having to freeze in -20 degrees? I’m in! A few months down the road and the day has finally come: before catching our flight back home, we’ve scheduled a 3.5 hour dog-sledding adventure with Basecamp Explorer. Our guide Camillla picks us up at the hotel and we make a pit stop at Basecamp Hotel for a security briefing. Svalbard is the kingdom of the polar bear after all, so it’s vital for our own and the group’s safety to follow Camilla’s instructions at all times. Afterwards we head deep into Adventdalen valley, past the famous polar bear warning sign and majestic Hiorthfjellet Mountain, and on to the Trapper’s Station where 95 huskies are eager to greet us. Before we make our way to the dogs though, we’re introduced to the life of Arctic trappers from the olden days. Trappers from Russia and Norway settled in Svalbard in the 17th to 19th century and hunted mainly foxes, seals, walrus, whales and polar bears. The latter were hunted through means of a specially designed trap containing a rifle and a piece of meat. When a polar bear got curious and stuck his head into the trap to get the meat, the rifle would be released and the polar bear shot in the head. Unfortunately for the latter, many smaller polar bears and cubs were shot in the back by this trap, resulting in unnecessary pain for the animal. For this reason, the traps were abolished but Trapper’s Station still has one on display for you to have a look at. After our short history lesson about the life of trappers and a tour of Trapper’s Station itself, it was time to get dressed before greeting the dogs. Our stylish royal blue overalls were meant as protection from mud and dirt, but also allowed us to be seen more easily in the brown tundra. The dog yard was buzzing as every dog wanted to say hello to us and get our attention so it took a while before everyone calmed down. Naturally, as soon as we got out the harnesses, the barking continued as everyone wanted to join us and hoped to get picked for the tour! If I didn’t know it before, I definitely realized at this point how eager these dogs really are to run! In winter, they often run more than 40 km a day, so it’s natural that they also need plenty of exercise in summer. These fluffy creatures are just full of energy! A quick lesson in how to put on the harness and attach them to the wagon and we’re on our own to find our team. Each wagon has space for two people, one driving and one sitting, and is drawn by 6 dogs. We each got a list with the dogs of our team and instructions of where to place them. The most intelligent dogs go to the front as they will lead the pack, while the strongest ones go to the back as they do most of the work in pulling the wagon. Turns out, finding the dogs in the kennel was a much bigger challenge than actually putting the harness on them and leading them to the wagon. The ladies were particularly calm and patient with our first tries of handling the harness – I guess they’ve experienced hundreds of rookies before and know how to behave already. The boys were a bit more impatient and eager to get started so that harnessing them was a tad more difficult but not unmanageable. Once all teams were ready, the only thing we were lacking was instruction of how to actually handle the wagon. Turns out, if you can ride a bike, summer dog-sledding won’t be a problem for you. There’s just two brakes which should be secured at all times when stopping to go off the wagon - and when let loose, the dogs will start running immediately, eager to follow our guide Camilla and the other dogs. I have to admit, I was slightly scared to lead the dogs off the road so I left it to my partner to drive the wagon for the first half of the trip, and enjoyed the gorgeous Arctic scenery from the seat of the wagon. The view gliding past tundra, mountains and grazing reindeer was just stunning and as I found out later, mushing isn’t as complicated as I thought it would be – and actually much more fun than just sitting on the sled! Our destination for the day was the old mine no. 6, which was in use in the 1970s and since, has been abandoned. There we had the not so easy task of turning around – which with 6 dogs in tow, can quickly become a tangled nightmare. After around 1 ½ hours, we got back to Trapper’s Station, both the dogs and humans happy but exhausted. The no. 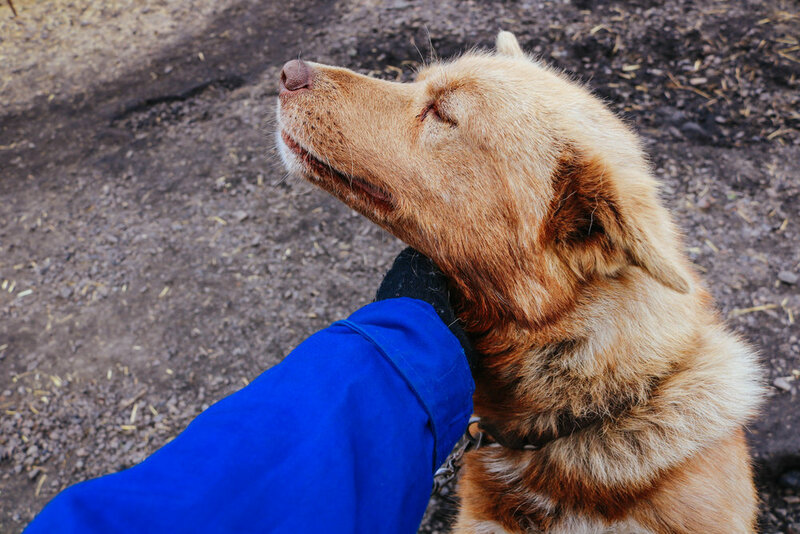 1 rule when working with the dogs is that their wellbeing has top priority, so the dogs all got water and we removed the harnesses, led them back to their little huts, and thanked them for a ride with a cuddle, before ending the trip with cookies and snacks ourselves. 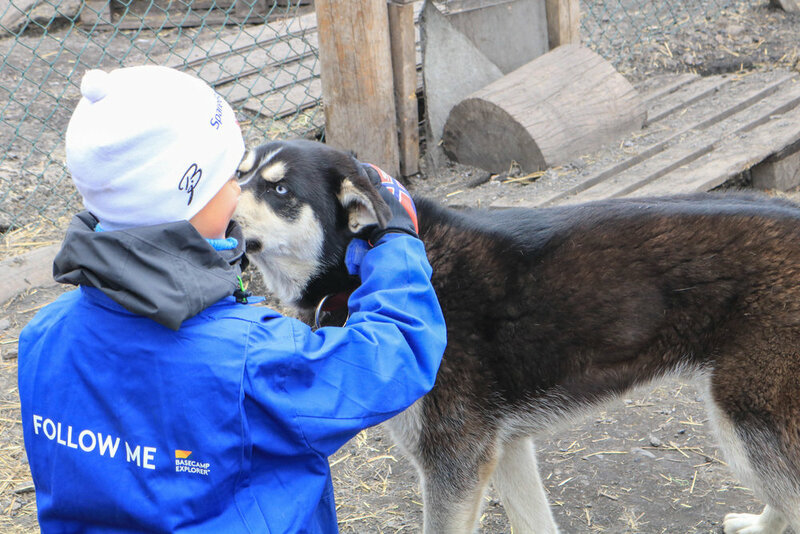 No trip to a dog yard is complete without a cuddle with puppies though, so at the end of our adventure, we also got to visit the sled-dogs-to-be. Wild and playful as they were as dog teenagers, they weren’t quite as interested in cuddles as in munching our clothes - but who could be angry with those deep blue eyes? 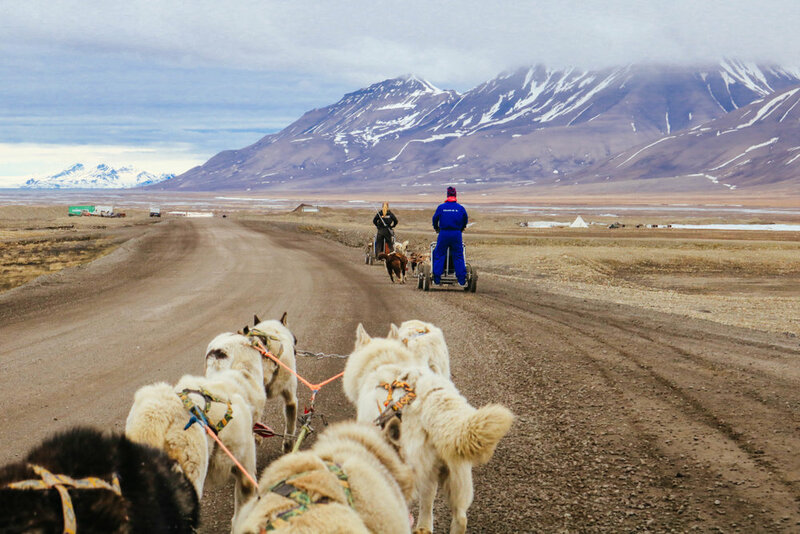 Basecamp Explorer offers summer dog-sledding twice a day between June and September. 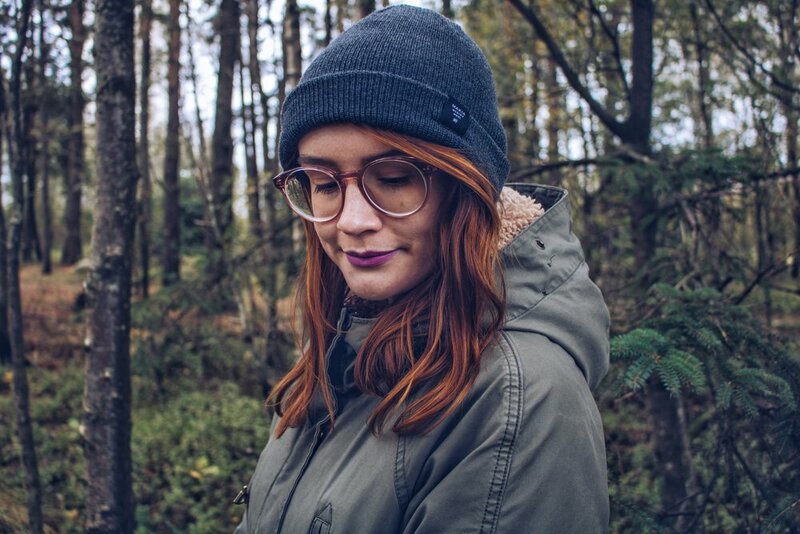 It is recommended to wear warm clothes, as well as mittens and a hat, as it gets quite chilly on the wagon – especially if it’s windy in the valley. You can book your trip via Basecamp Explorer or Magnetic North Travel. Many thanks to Magnetic North Travel for organizing the trip and Basecamp Explorer for the ride! Are ready to explore the High Arctic? Read my detailed guide on what to keep in mind when visiting Svalbard below! 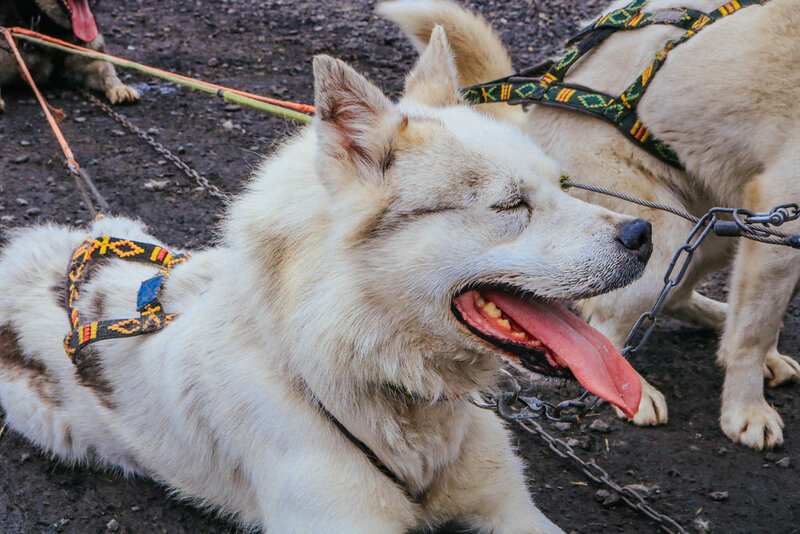 Would you rather go dog-sledding during summer or winter? PS: If you'd like to see Svalbard on tape, head over to my Youtube channel for a sneak peek! 1. Link up a wanderful travel related post below! One per blogger per week please! 2. Spread the LOVE! Blog Hops are all about hopping around & getting to know others within the community! At the very least please try to comment on one other post before you go! 4. Don’t forget to grab the button or link back to your wanderful hosts! Help us spread the word and let’s get others involved!